Theo J.F. Schalke – adapted from the text of the award winning single frame exhibit (16 pages) of Joe Ross, Cal – Revenuers Chapter of the American Revenue Society, with examples from my own collection. Additional information from the Internet and help from other AMG collectors such as Dave J. Beeby, Terry Safford, Thomas J. Richards, Eric Jackson. Thanks a lot to Theo and his collector fellows for this excellent guideline. The Allied Military Government for Occupied Territories (originally abbreviated AMGOT, later AMG) was the form of military rule administered by Allied forces during and after World War II within European territories they occupied. The first countries occupied by AMGOT were Italy and France in1943. Based on experiences of the British in Libya, civil affairs officers naturally came under the control of local military commanders in combat zones. But once an area had become non-operational it was administered quite separately from the occupying forces. This was AMGOT unwittingly helped to revive the Mafia in Sicily, and later extended to Italy. The AMGOT would have been implemented in France after its liberation if not for General Charles de Gaulle establishing control of the country per the Provisional Government of the French Republic in the name of the Free French Forces and the united French Resistance (FFI) following the liberation of Paris by the French themselves instead of the Allies, in August 1944. The First French Army refused to withdraw and frustrated AMGOT’s establishment there. Roosevelt resolved the situation by refusing the French any more military supplies until they withdrew, which they did on 10 June 1945. There were also some difficulties in Trieste, which Tito’s forces had occupied, but this was also solved eventually. Having a separate chain of command from the army made AMGOT unsatisfactory, and it was not used in Germany or Austria. After Victory in Europe, at the Yalta Conference in February 1945, the new borders of both countries were decided. 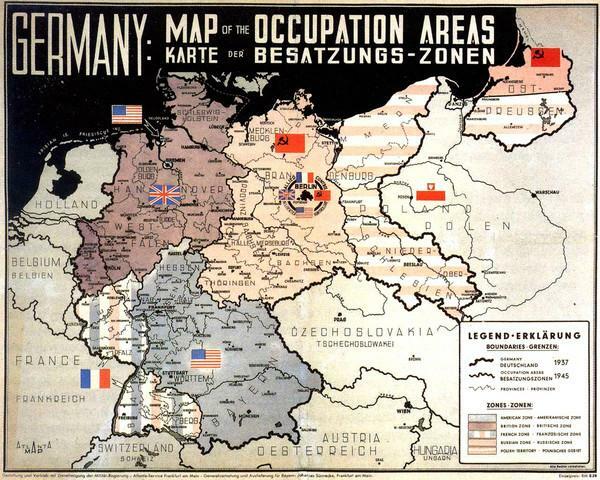 The Allied Control Council (ACC) for Germany oversaw the Allied Occupation Zones in Germany. The ACC was established by agreement of June 5, 1945, with its seat in Berlin. Its members were Great Britain, France, the Soviet Union, and the United States of America. Cooperation by the ACC broke down as the Soviet representative withdrew on March 20, 1948. After the breakdown of the ACC, West Germany (and West Berlin) was ruled by the Allied High Commission with membership from Britain, France, and the United States, while East Germany (and East Berlin) was ruled by the Chairman of the Soviet Control Commission, later the Soviet High Commissioner. The Allied Commission for Austria was established by the Agreement on control machinery in Austria, signed in the European Advisory Commission in London on July 4, 1945. It entered into force on July 24, 1945 on the day that the United States gave notification of approval, the last of the four powers to do so. Austria was divided into 4 Zones: American, British, French and Soviet. Vienna, being the capital, was similarly divided but at its centre was an International Zone, sovereignty of which alternated at regular intervals between the 4 Powers. The commission had its seat in Vienna. The control and cooperation between the commanders of these areas was arranged by these Allied Control Commissions and they ran the civil administration. Later it came known as the Allied Military Government (AMG). Written permission was required, for security reasons, in allowing the crossing of frontiers to and from Germany. The Headquarters of the Allied Forces, the Allied High Commission, instituted the usage of Fiscal stamps to indicate prepayment on special Entry Permits into Germany and Austria. The British, French and US military were still responsible of Border control in their respective Zone(s). June 1943 The War Department placed an order for Allied military currency (AMC) with the Bureau of Engraving and Printing. The first AMCs were used by Allied forces in Italy. Production on Allied military postage stamps started July 1943. And July 1946 The Bureau of Engraving and Printing begins work on Military Payment Certificates for use overseas by U.S. troops. CLICK HERE for the full document with several pictures as PDF-file (15 pages, 2.5 MB).